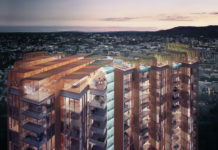 The team at MODE have designed one of Brisbane’s first subtropical rooftops for 192 Central Development by Japanese owner, Daisho Co Limited. MODE’s landscape architects and architects designed the 865 sqm north facing terrace to focus on external spaces with a glass bridge connecting 192 Central to the recently completed 180 Brisbane by Daisho. The integration at the podium level allows for ease of movement between the two buildings. The project realises three distinct areas including a BBQ kitchen area, an amphitheatre and a relaxed, flexible activity space. In determining the most appropriate design solutions for the rooftop terrace, MODE considered the values of key stakeholders, to capture not only the functional aspects of the brief but also draw upon Brisbane’s subtropical environment, to create a unique identity. Brisbane’s identity as a subtropical river city and the influence this has on its building design establishes a point of difference from other capital cities. MODE’s design is said to capture Brisbane’s established identity by creating an innovative and ecologically sustainable subtropical landscape. In order to offset urban heat island effects, sustainable design was achieved by controlling the entry of direct sun during the winter and summer months, while providing cooling paths for breezes. MODE Director, Alayna Renata said MODE contributed to the project’s innovation by using considered design strategies for built form, mass and scale that reflects the existing surrounding region, city and site context. “Re-development of the rooftop space at 192 Central provides an urban oasis amongst the noise and heat of the city. 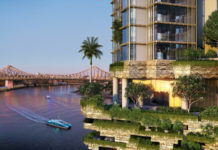 Described as a ‘Sky Garden’, it provides a welcome respite from the sights and sounds of the urban environment, while maximising viewing points with raised observation platforms to allow 360 degree views of surrounding high rises, King Edward Park, Kangaroo Point Cliffs and City Hall,” said Ms Renata. The project methodology implemented a three-tiered, bottom up approach focusing on compliance to address the need for shade, DDA standards and softscape, functionality to ensures users can utilise the space for a range of purposes and amenity to consider Brisbane City Council’s (BCC) Planting Species Planning Scheme Policy and BCC’s Water Conservation Planning Scheme Policy for compliance with the BCC City Plan. Complicit to the successful delivery of the project, was the inherent understanding and strategy to overcome limitations of the existing 192 building structure. The existing base building structure was designed without redundancy in its loading and as such, did not easily enable additional levels or infrastructure to the rooftop. For Daisho to deliver their vision, MODE, along with Calibre Consulting, collaboratively designed and engineered a grillage system that elevated the rooftop level and transferred the additional loads for the proposed terrace to the perimeter of the existing building structure. The grillage structure is a complex web-like form enabling integration with planting and shading structures as well as a glass bridge, lift and entertaining area. The raised platform introduced complexities in the resolution of its balustrade enclosure, while improving access and hinge points for the landing point of the interconnecting bridge. Although an incredibly complex project, MODE Director, Megan Rodgers recognises the success of the project for Daisho and the project team. “From inception, the project team understood the complexity and nature of the project and genuinely committed to meeting design, construction and procurement milestones whilst upholding quality, functionality and aesthetic aspirations for the project. With a design that has been driven by constraint and opportunity based analysis, the success of the completed works demonstrates the ease with which all the building elements are comprised to create a multi-functional space that will provide unprecedented amenity to both the tenant and Daisho,” said Ms Rodgers.